Magento 2 File Permissions after Deploying live and in production mode? What should be file permissions in Magento 2 after deploying website to live and website is in production mode. I have read many forums and found that the file permissions of folders generated,var and pub should be 777 but in Magento 2 documentations it is different.This create a little bit confusion so please let me know if anyone have idea about this. We are getting issue that permissions changed automatically to root and website stopped to work.We are not able to run the Magento command without sudo. Currently we are having ubuntu user and www-data group. Please share your thoughts how to run Magento command without using sudo in details.We are using AWS server. I have followed answer of this question but still permission are changed for cache and page_cache folder.It is still creating with user www-data. It sounds like you are running "Two Magento file system owners in production mode"
If using PHP-FPM ensure it's running as same user and group as the web server. Not the answer you're looking for? Browse other questions tagged magento2 or ask your own question. 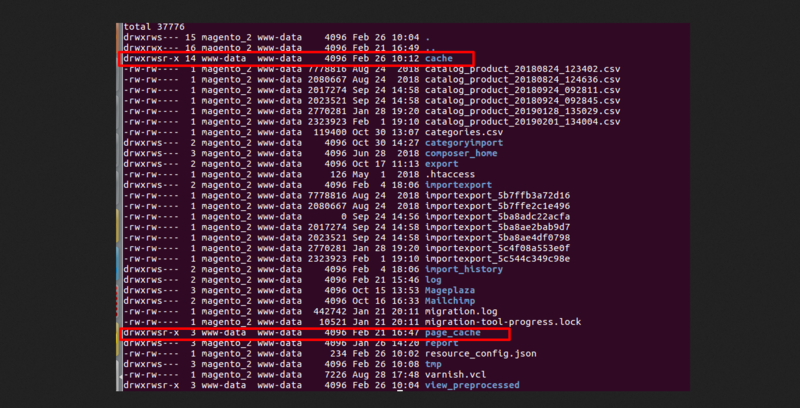 Why static files are not generated or cached in Default or Production mode in Magento 2? Why is the file permissions check failing? What are the correct file permission settings for magento 2.2 on a single-user production environment?